Memorial Day is this weekend, so in my book, that means an extra day for SHOPPING! 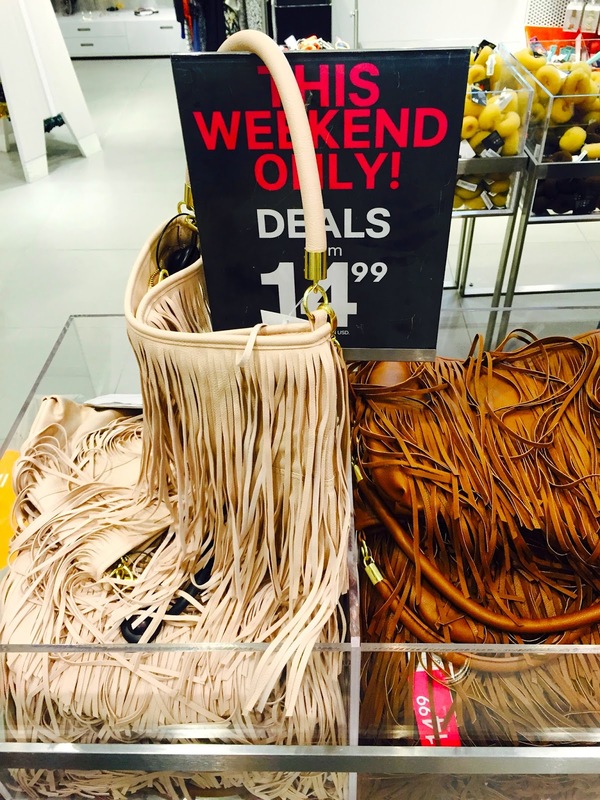 I had a sneak peek into three stores to give you the dish on some items on sale this weekend. For those in the Bay Area, I adore Hillsdale Mall, it’s my pick of places to take clients shopping. I know this will surprise some that have seen my accessory collection for themselves, but I have been getting a little bored of what I have (insert gasp). So perhaps I might have to take advantage of this great sale at Old Navy to get myself some fun new pieces. In fact, the entire store is on sale. Neon’s and bright statement pieces are a great *SS15 item. 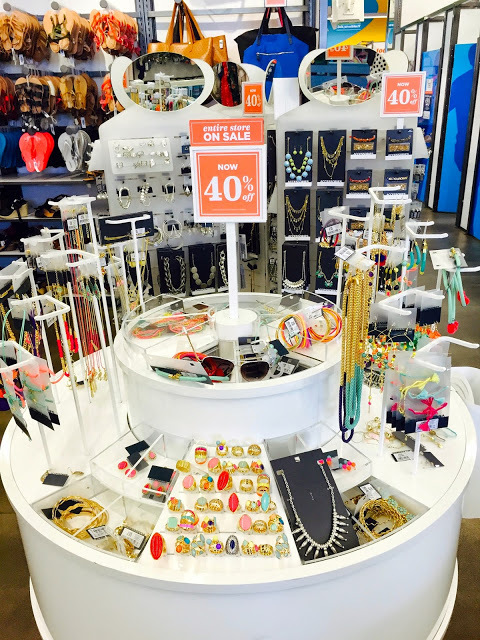 On sale, you’ll see everything from necklaces to bracelets, earrings to rings. 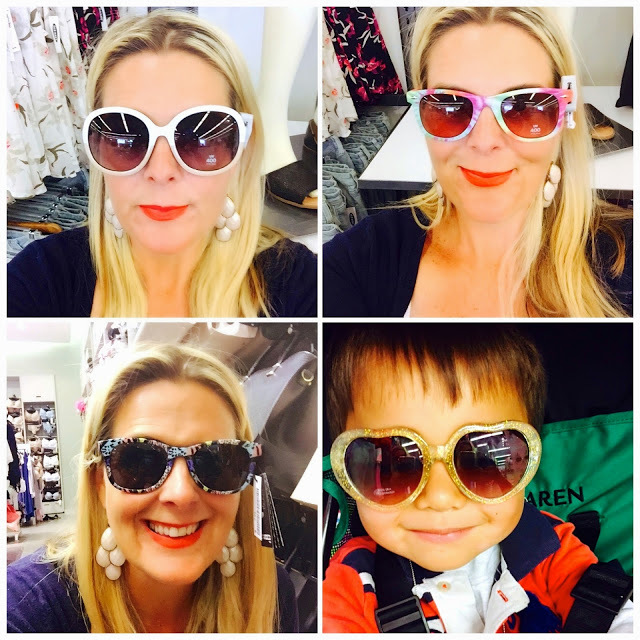 Time to update your look and play with some fun summer sunglasses……..
Below is my latest Old Navy pick this week and I certainly had fun wearing it while trying to harness summer and sunshine to a very unusually grey California week. 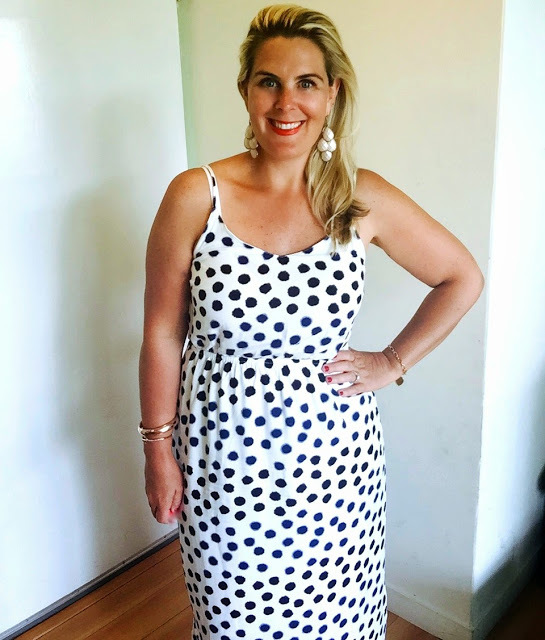 I first found inspiration from fellow blogger Ask Suzanne Bell, who donned this dress. $22, yes, just $22! Paired with a navy cardigan that day and some white/gold statement earrings. Love the different shades of blues/purples in the dots. Want to embellish in some fringe this season. Another *SS15 shout out! Have some fun playing with this fun number for only $14.99, this weekend only. 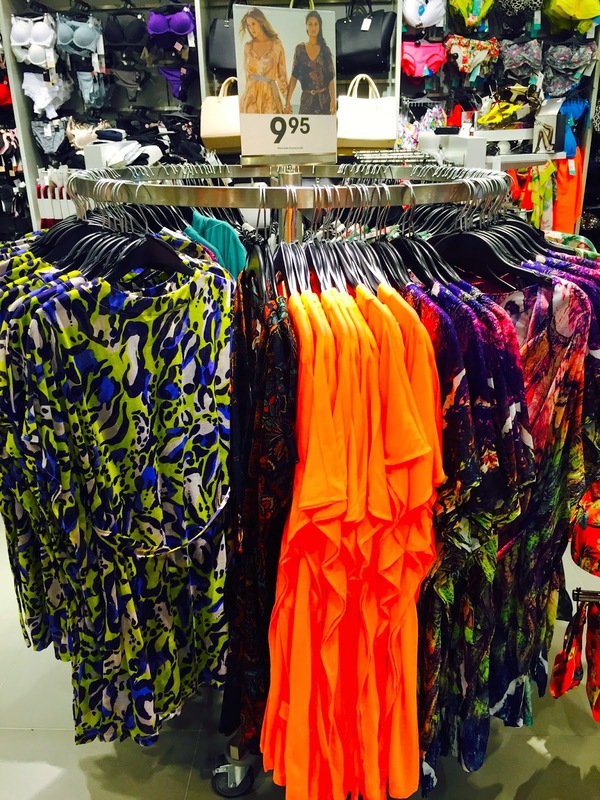 H&M also have swimwear cover ups on sale and for only $9.95. A print for everyone. Read my post on Yummo Mummo – Swimsuit Edition for more poolside inspiration. Gap will have 40% off the entire store. So I think this could be a great chance for you to grab a great staple in anyone’s closet – the chambray shirt. Pick your wash and have some fun. Need some inspiration? 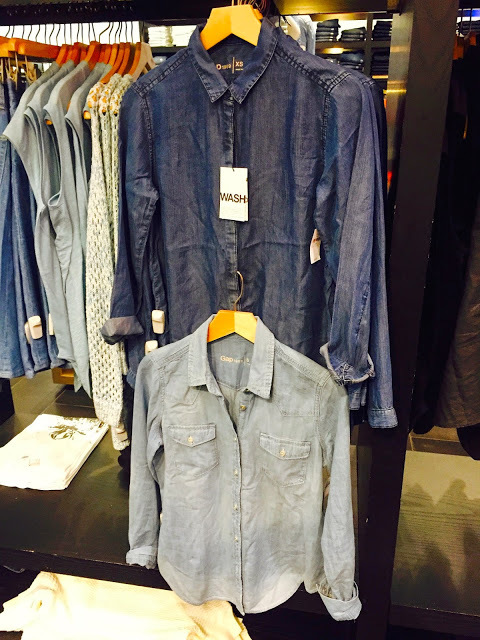 Read my post on Seven Chambray Shirt Inspirations. I am off to a White Party to celebrate a friends birthday next weekend and I have a white dress, now for the shoes. I did find these super cute white espadrilles. I love that they are a white vegan leather vs a cloth material that is sure to get stained in a New York minute, as white shoes do so easily. These babies would be down to $40+ with the 40% off. 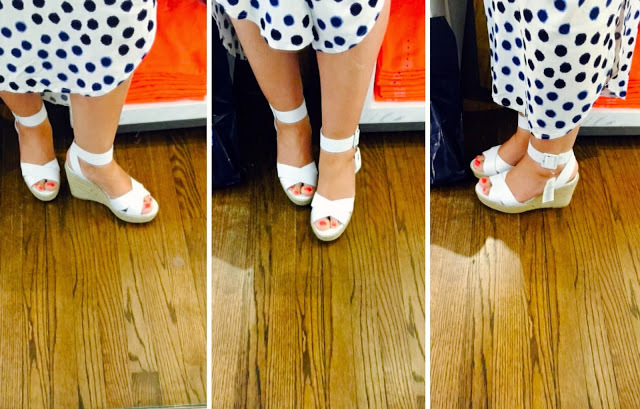 Looks like a no-brainer, and a fun shoe, for many summers to come! Don’t forget, YummoMummo can do wardrobe for YOU! 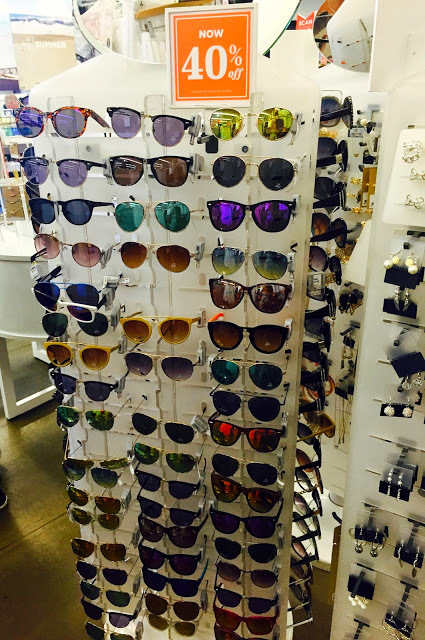 If you need a wardrobe audit, outfit inspirations, personal shopping or help finding the perfect outfit, then let’s make you the Yummo to my Mummo. Now who doesn't love a good sale! Thanks for sharing wish I lived in the US sometimes you have such a wide variety to choose from. That photo with you trying on all the glasses is so cute!! Cute dotted dress! I heard that Old Navy has new management and more updated design. Gotta go check it out soon! I love the polka dot dress too Allison. It's defiantly going in my suitcase for Hawaii! Thanks for reading.